Peanut Butter & Co. - ilovepeanutbutter.com | Happy Ants on a Log Day! Home / Recipes / Happy Ants on a Log Day! Happy Ants on a Log Day! We teamed up with Duda Farm Fresh Foods, to put three new twists on the classic Ants on a Log! 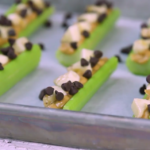 Whether it’s with Pumpkin Spice peanut butter, salted caramel, or bananas, Ants on a Log is a perfect after-school treat for kids, or any-time snack for adults! To celebrate we’re giving you 20% of orders $25 and over until September 17th! Want more Ants on a Log recipes? Find those here! 1. Spread the nut butter from your chosen recipe evenly on all four pieces of celery. 3. Pack them for lunch or enjoy them right away! The post Happy Ants on a Log Day! appeared first on - Peanut Butter & Co. Recipe Blog.